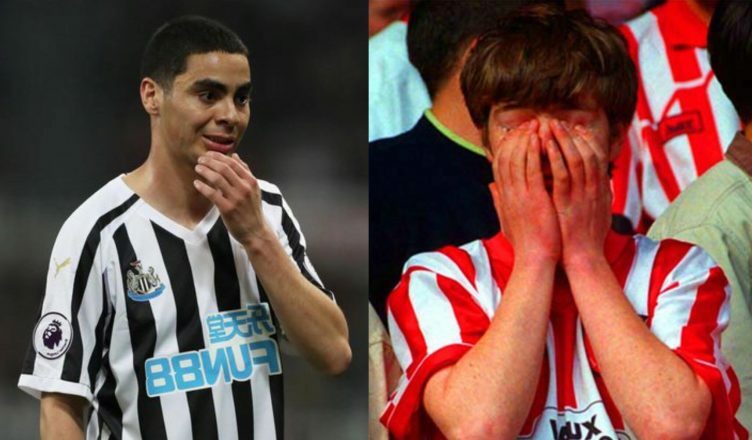 Embarrassing Sunderland fans target Miguel Almiron – but the joke’s on them.. – NUFC blog – Newcastle United blog – NUFC Fixtures, News and Forum. If tweeting ‘rocking all over League One’ wasn’t bad enough (they’re 3rd..), Sunderland fans have now created a Twitter account named “Has Almiron scored yet?”. It can’t be easy for them – you know, after back to back relegations – but it seems they couldn’t handle the fact we’ve signed a talented player who, despite not scoring just yet, has looked like a real talent in his first 6 games for the club. No. But I might get one against Peru next weekend. Does that count? I’ve even seen Sunderland fans on social media genuinely trying to argue that he’s no better than the Mackem’s very own Duncan Watmore, saying ‘he can run..that’s it’. We’re the ‘obsessed’ apparently. Aye, right..
Cant believe they actually the audacity to compare a top quality, entertaining premier league player to a…. well…… 3rd tier player. Almiron may not have his opened his goal account yet, but he has provided the most goal scoring chances in the top tier since he signed. Has produced moments of magic that make you wonder how mint he’s going to be when he’s fully on form, and proved his pace can unlock teams. Im afraid the mighty 🤣 mackums would find poor Duncan Watmore being abused and embarrassed by a little paraguayan in black and white stripes. It’s a shame they’ll never get to see him play live, he’s too busy destroying premier league defences. No time for Accrington Stanley away unfortunately. Imagine being 3rd in league one though 😂😂😂 O’well they do have Butch Dingle I mean Duncan Watmore don’t they! I have no idea who Duncan Watmore or any of their other players are. Says it all really…. He wasnt bought as a goalscorer you p***ks…!